Spring is in the air and that means boots on the ground for the 14-member SNAP team. 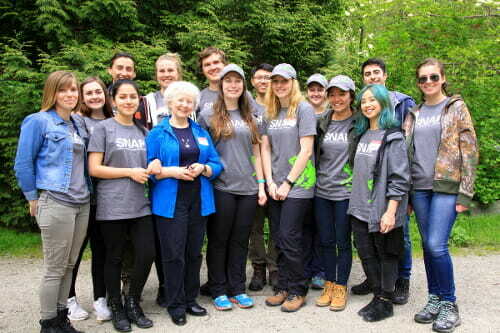 The Surrey Natural Area Partnership (SNAP) started the 2017 season on Wednesday May 10 at the Surrey Operations Centre. 14 college and university students will be employed for the summer, thanks to the federal government’s Summer Jobs program. They will be divided into three teams: habitat restoration, urban forestry outreach, and tree care. Two more students from high school will be hired for the summer months. All five of Surrey’s MPs contributed this year: John Aldag, Randeep Sarai, Ken Hardie, Sukh Dhaliwal, and Dianne Watts. 2017 is the 17th year for SNAP. It’s a partnership between the Green Timbers Heritage Society, the Sunnyside Heritage Society, the White Rock and Surrey Naturalists and the City of Surrey. It’s an example of how community groups can work with municipal governments for everyone’s benefit. Surrey’s natural areas cover about 1400 hectares and include over 80,000 trees. The three teams will work on invasive plant removal, native planting maintenance, garbage removal, door-to-door canvassing, hosting community events, park hosting, installing tree base wells, tree watering as well as other projects that benefit our urban forest. The program is an opportunity for students to learn from leading practitioners of urban forest management and make great connections in the industry. “Surrey is ahead of the curve when it comes to this kind of management,” says Kris Mohoruk, team leader for the habitat restoration team.